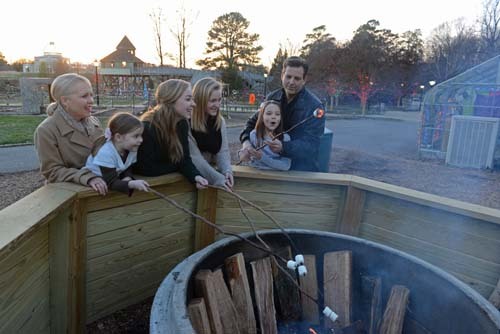 Dominion Energy GardenFest of Lights is a holiday tradition featuring more than half-a-million twinkling lights, hand-crafted botanical decorations, model trains, holiday dinners, firepit with s’mores and hot chocolate (for purchase); nightly family activities & more. Garden Members are always FREE on GardenFest Member Nights! View our Member Nights page to see the dates for this year’s Member Nights and to learn more about additional discounts Members get for their guests on Member Nights. One great benefit of being a Garden Member is that in addition to free Member Nights, Garden Members also get special member pricing when they visit on other nights. Members may purchase one member-priced ticket per day for each person admitted on their membership. Member prices are $7 for Adults/Seniors and $5 for Children 3-12. For those who have a Family or Friends membership, those ages 3-17 may receive the child Member rate of $5. Members may purchase discounted tickets for up to 4 non-member guests. Any additional tickets are regular price. Maximum of 4 Member Guest-priced tickets per transaction. Guest prices are $10 for Adults, $8 for Seniors, $6 for Children 3-12. Guest passes are not accepted for free or discounted admission to Dominion Energy GardenFest of Lights. Members of Reciprocal gardens do not receive a Member discount during special events, including Dominion Energy GardenFest of Lights.